When you’re buying a house, it’s a good idea to learn about the local school district. Even if you don’t have children, a school district can have a big impact on your neighborhood. A school district can also have a big effect on your home’s value. Houses in different school districts hold their value differently. Though, location is more important and affects value even more so than the school district. Nobody’s sure whether high-value homes contribute to the success of a particular school district, or whether certain school districts mean higher value homes. We do know that one in five home buyers are willing to pay up to 10 percent more than their budget for a home in the school district of their choice. In addition, one in ten buyers is willing to pay a 20 percent premium for a home in a school district they like. Why should you consider the quality of the school district when you’re buying a house? If you have children — or are planning to have them — the reasons are straightforward. A high-quality school district will provide your kids with a good education and great opportunities. But how important is a school district to buyers without kids? With these benefits, it’s no surprise that 91% of home buyers reported that school district borders were an important consideration in their home search. Read on to learn more about how to determine what school district is good for you. There are a growing number of school options open to families. From public and private schools to charter schools and magnet schools, the array of choices can be overwhelming. One of the first steps in choosing a school district is to learn exactly what options are open to you. 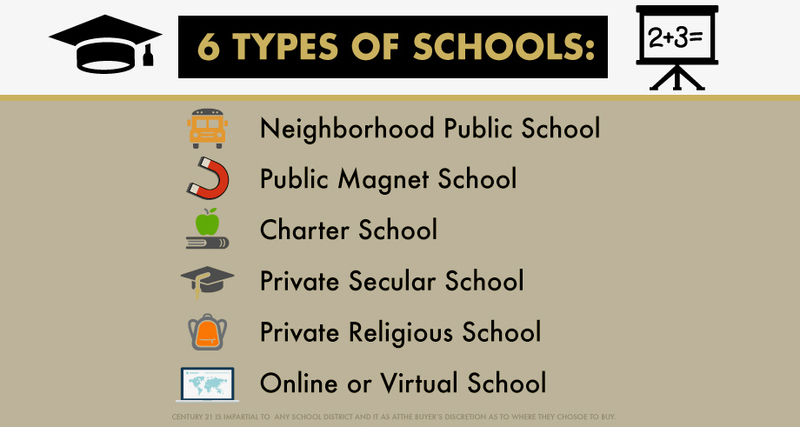 In general, there are six different types of schools. This is the most convenient option for many families. Neighborhood public schools usually accept all children within a geographic boundary. Attending the local public school makes it easy for kids to become friends with other nearby families. Because the school is near your home, transportation is usually convenient. Many children are able to walk to school. Working on group projects, attending after school activities and socializing with friends is usually easier for kids at a neighborhood public school. Magnet schools are public schools that focus on a particular theme or skill set. Common magnet school themes include STEM — science, technology, engineering and math — arts or drama or vocation preparation. Although magnet schools are still part of the public school system, they’re open to students regardless of their “home” school district. However, your child may need to apply for schools via a lottery or pass a test prior to enrollment. Charter schools operate independently from the public school system, although they receive public funding. Like public schools, charter schools can’t charge tuition and are open to all students. Students can usually enroll in a charter school regardless of the school district they’re located in. Charter schools may use a theme-based approach like magnet schools or a particular teaching style like Montessori or Waldorf. Private schools are responsible to a board of directors instead of the public school system. They usually charge tuition and can admit students regardless of the public school district they reside in. As a result, students come from a wide geographical area. Like charter schools, private schools may focus on a theme or subject or use a particular teaching approach. Many private schools are college preparation schools, and they focus on preparing students for university. Students may need to pass a test to enroll in a private school. The vast majority of private schools in the U.S. are religious. These schools are usually associated with a denomination or religious faith, such as Catholic, Protestant or Jewish. They can admit students regardless of their school district. Like other private schools, they’re usually responsible to a board and often charge tuition. Because they operate independently, they’re not required to conform to federal education mandates. However, private religious schools often offer a college preparatory program or themed learning approach. Religious education may be offered. Online or virtual schools are also growing in popularity. Some school districts offer an online option, usually called “distance learning.” Other online schools are private. Students usually have the option of enrolling in just a few online courses or studying an entire curriculum online. Because online schools are completed at your own pace, they’re popular options for students with learning disabilities, who benefit from additional time to learn material. They’re also often used by advanced students who want to study a subject not offered by their local school. The next step in determining the right type of school district is to figure out what a good school district means to you. If you have children who will be entering the public school system soon, this is particularly important. How important is a racially or socio-economically diverse classroom? How large of a class size are you comfortable with? Are children with learning disabilities integrated into mainstream classes? Is after-school care available? How many students use it? Are you looking for a bilingual school, or one that offers second language tutoring? What is your child’s learning style? What types of education would support their learning style? What type of tutoring or learning services would you like the school to have? Does your child have any special needs that the school should be capable of supporting? Are you looking for a themed or magnet school? What types of extracurricular or after-school programs would you like your child to have access to? Are you more interested in a traditional academic approach, or would a school that focuses on creativity and emotional intelligence be a better fit for your child? How much of a role should technology play in the classroom? What type of disciplinary styles are you comfortable with? Are you looking for a school that offers a “positive discipline” approach? Do you want a school that has a diversity program? Is it important to you that a school has an anti-bullying policy? Should the school have experience with students with allergies, disabilities or medical conditions? Can your child buy lunch at school, or will you need to pack lunches? Would you prefer to drop your child off, or would you prefer them to take a school bus? Are you looking for a year-round school schedule? Once you’ve identified what programs and amenities are most important to you, it’s time to take a look at the local school districts. If you have a residential address in mind, you can find your local school district at Great Schools. Great Schools provides reviews, a Great Schools ranking and basic demographics and test scores. If you have a city, town or metro area in mind, consider using Niche to compare public and private schools in the area. They also provide a map that shows school district boundaries for elementary, middle and high schools. Like Great Schools, Niche provides an independent rating and basic demographic information about school districts. If you’d like to live within a particular school district, contact the school to confirm that your address is within the school district’s boundaries. You may also want to ask whether there are plans to amend the district’s boundaries in the near future. Great Schools: Great Schools has an independent ranking system. It evaluates schools based on three factors: student achievement, student growth and college readiness. Schools are ranked one as the lowest through 10 as the highest. One of the nice features about the Great Schools ranking system is the ability to compare a school’s score with that of other schools serving similar demographics. Niche: Niche offers a report-card style ranking for school districts. Good school districts usually score A’s and B’s, while lower ranked school districts score C’s and D’s. They use the graduation rate, drop-out rate and math and English literacy tests to calculate their scores. You can also compare public and private schools through their website. Your state’s school assessments: Each state offers their own school assessments, which are usually made available online. Pennsylvania, for instance, has students take the PSSA between 3rd and 8th grades. Most states have adopted the Common Core Requirements. So even though the specific test differs, what it tests is fairly similar. Most states’ assessments test students’ common core competency. Classroom demographics and academic ratings only tell you so much. To learn what a school district is really like, ask for local perspectives. Your REALTOR® is one of the best people to start with. REALTORS® usually know the community they serve well and can give you more perspective on how a school operates. They may be able to tell you whether there have been recent administrative changes, whether there are budget issues that could impact classroom sizes and what other parents in the area have said about the school. Your REALTOR® may also be able to put you in contact with parents whose children are enrolled in the school district. You can also check with local parents’ groups. Are you happy with the local school district? How often do you meet with your child’s teacher? How much homework does your child bring home each day? How do teachers support children who are struggling in a class? What extracurricular or elective classes have their children taken? How involved are parents in the school? What types of volunteer or fundraising commitments are expected of parents? Are there particular types of students or learning styles you feel would struggle at this school? How many students are in your child’s class? Not all parents visit prospective schools. If you’re unsure whether a school is right for your child, visiting the local campus can tell you a lot. First, find out the school’s policy for visits from potential families. Some schools allow parents to visit on a drop-in basis. Others have just one or two open houses each year. If you’re looking for a school that welcomes parent involvement, finding out how they handle visits from potential families is your first step. Second, arrive a little early. You’ll be able to see more of how the school operates when you’re not on the “official” tour. Look at how teachers and school staff interact with students. You may be able to see how drop-off is handled or how students transition between classes. Third, remember to ask students what they think of the school. You’ll often find a different perspective from students than you will from parents and teachers. Finally, remember to check out the campus. Is the school well maintained? Are exits and safety equipment easy to find and well marked? Do classrooms have good-quality books and equipment? If you’re visiting an elementary school, remember to take a look at the playground equipment. If you’re considering a charter, magnet or private school, you’ll need to confirm that your child will meet the school’s admission requirements. If he or she doesn’t meet the requirements, make sure you have other options available. Some schools enroll students on a first-come-first-served basis. If you plan to move during the school year, you should know that the school may not have a spot for your child immediately. Many schools enroll students based on a lottery system. You’ll be able to submit an application for your child, but they may find themselves on a waitlist or denied entry. Other schools, particularly magnet schools, require an entry exam. Your child will need to prove an interest or skill related to the theme of the magnet school. Magnet schools can be very competitive, and many applications are rejected. If you’re not sure that your child will be accepted, investigate what alternatives are available. Is the local public school in a good school district? Finally, remember that school rankings aren’t the only factor that influences your child’s education. Studies show that the classroom environment, your family environment and your child’s friends all play a role in your child’s educational success. That’s why it’s more important to choose the right school district for your child than it is to find the highest ranked district. With this guide, you’ll be better equipped to find the right school district for your family. If you are moving and would like some help – Please contact CENTURY 21 Core at 717-718-0748 today!